Tonight's game is the second of a four-game home stand. The four games mark the longest home stretch to open a season in franchise history. The previous longest was three games (1975-76 and 2015-16). After being named captain on Wednesday, Jack Eichel became the 19th full-season captain in franchise history and the 28th player to wear the captain's "C" for at least a one-month period for the Sabres. Went 55.1% on faceoffs in his 10th season with St. Louis in 2017-18. Named Swedish Junior Player of the Year (SHL) in 2017-18. Set NHL highs in every major category in 72 games in 2017-18. Led NHL in SV% (.931) and GAA (2.09) with St. Louis in 2017-18. Two-time Stanley Cup Champion (2016 and 2017) with Pittsburgh. Ranks sixth in the NHL with 143 5-on-5 goals since entering the league in 2010-11. Set career-high totals in GP (81), G (11) and GWG (4) in 2017-18. Made his NHL debut with St. Louis in 2017-18. 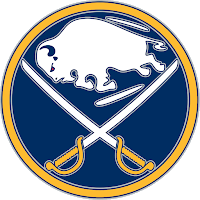 It marked the second-most new players the Sabres have ever dressed in a season-opener, trailing only the nine players who made their Sabres debuts on Oct. 10, 2015 vs. TBL (Carlo Colaiacovo, Jack Eichel, Cody Franson, Chad Johnson, Evander Kane, David Legwand, Robin Lehner, Jamie McGinn and Ryan O'Reilly). Only 10 of the 20 Sabres players who dressed for the first game of the 2017-18 season appeared on the team's 2018-19 opening day roster. Kyle Okposo: Played for the United States at the 2012 IIHF World Championship in Finland and Sweden when Rangers Head Coach David Quinn was an assistant coach for the team. Jeff Skinner: Played for Team Canada at the 2013 IIHF World Championship in Slovakia when Rangers Assistant Coach Lindy Ruff was the head coach of the team.